← 2012 Calendar Full Preview Now Available! 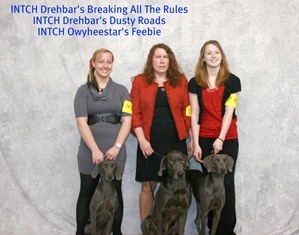 Int CH Drehbar’s Breakin All the Rules – Tessa received 3 V1 ratings and earned an International Title – we pulled her from the 4th show by choice because she was in full heat and dripping and I felt it wasnt fair to other competitors. Int CH Owyheestar’s Feebie Earned 4 v1 ratings and one BOB of breed win she also earned her International Conformation Champion title. I really enjoy the IABCA venue and plan to show three more times with them this year. Weren’t you the only 3 Weimaraners at the show? The International All Breed Canine Association venue is unique in that the Judges evaluate the dogs to the standard. Each Judge (4 in a weekend venue) sits down with the handler and dog and goes over the written critique covering 12 points of the standard for that breed including; overall impression, coat, head, bite/mouth, eyes, ears, chest, front quarters, back quarters, tail, topline, & movement – the judge then rates the dog you need to receive three V-1 ratings to earn the International Title after receiving 6 points or an International & National Title you then can move up to continue competing in the Ehrenklasse (honors class). The judges are AKC & International judges. We enjoy this venue because it gives the opportunity to speak with experience judges regarding the breeding choices giving us an insight to the best qualities of our dogs. I have been following along with the blog and enyojing my friend’s excitement over her new puppy. That puppy is going to be so happy in her new home! I just wanted to tell you that I think you have done an amazing job with the first litter. I don’t know how other breeders treat their puppies but I would definitely say you are one of the best.